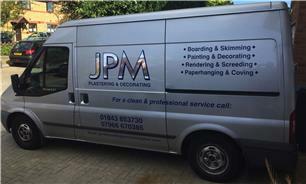 JPM Plastering - Plasterer based in Ramsgate, Kent. I set up JPM plastering in 2004 with the aim of providing a top quality plastering service to East Kent, focussing particularly on cleanliness. We offer all aspects of plastering including skimming, plaster boarding, rendering (March - October), screeding, dot and dabbing, floating and setting and production of fibrous cornice and plaster mouldings. My team are all apprenticeship served with either NVQ2 or NVQ3 qualifications. I am also a qualified teacher and I teach plastering at East Kent College on a part time basis.